Peter Doig (b. 1959 in Edinburgh, Scotland) is one of the most internationally renowned artists working today. Doig spent his childhood in Canada and Trinidad, which he continues to call home and which has influenced much of the colorful subject matter in the artist’s body of work. Over a career of nearly three decades, Doig has reinvigorated the medium of painting. His inventive style, sensuous palette and suggestive imagery set him apart from the conceptualism dominating much of contemporary art. A willingness to take up the challenge still posed by the paintings of Gauguin, Matisse, Bonnard and Edward Hopper places him in a long line of great colourists, expressive handlers of paint and creators of richly textured worlds. Doig’s pieces explore a theme of disorientation for the viewer, who are continuously plunged into worlds of shadows, reflections, and fantasy. 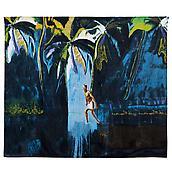 Doig was nominated for the Turner Prize in 1994. The same year he received the Prix Elliette von Karajan. In 2008 he was awarded the Wolfgang Hahn Prize of the Society for Modern Art, Museum Ludwig, Cologne.